Can you imagine – calling for democracy, political transparency, and political accountability? The nerves of those people … Didn’t they realise that in the land of al-Saud not even the wind is allowed to roam free … All must bow to the might of al-Saud monarchy – the Bedouins of Nejd, the tyrants of Arabia! But of course Yemen does not belong to Saudi Arabia – and while Riyadh has tried to change that reality, Yemen still stands an independent nation-state in Southern Arabia … Need I stress that Yemen is the LAST independent nation in Arabia, and that it is such independence the kingdom is ultimately working to crush and lay waste. Yemen and Saudi Arabia reached a tentative border agreement back in 2000 – the Jeddah agreement, in which then-President Ali Abdullah Saleh essentially signed off on three Yemeni provinces. With the stroke of a pen, President Saleh ended 65 years of tribal tensions, sporadic fighting, and much unrest. Surprise, surprise, Yemen landed on the short end of the straw … as for President Saleh, some have argued he received a payment of as much as $20 million to put his name on the dotted line. Opposition groups told the press back in 2011 they believed Saleh had received a payment of $18 billion in exchange for his cooperation in solving Yemen-Saudi Arabi land dispute. Needless to say that Yemen northern tribes were not exactly thrilled with that set-up since it meant the partition of their land, their territories, their people. Moving forward Yemen and Saudi Arabia’s land disputes became the subject of heated political and tribal debates – an open wound onto the highlands, a betrayal, Yemen highlanders would never forgive, never mind forgot about. On the matter, Yemen had a strong ally in late Egyptian President Gamal Abdel Nasser who famously declared “Any power can attack the Yemeni people ... the Yemeni revolution is our revolution, and the revolution of all the Arabs ... We could simply isolate Saudi from Yemen completely by taking Jizan and Najran. 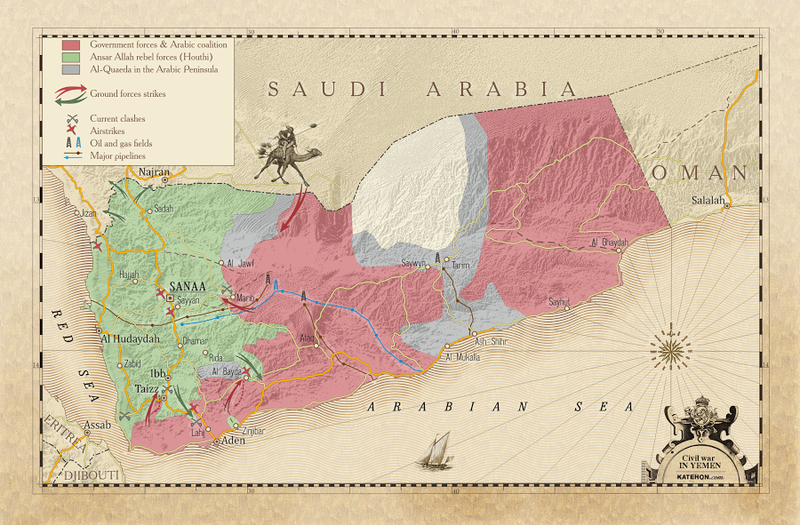 The Jizan province belongs to Yemen and was usurped by the Saudis in an invasion in 1930. The Yemenis have the right to demand [the return] of Jizan and Najran. We will be fighting in this war. We Egyptians alongside the Yemenis...Therefore no power can attack the Yemeni people’s revolution." Former President Saleh however crushed Yemen's dreams to see its rich lands restored when he agreed in 2000 to abandon all sovereignty claims on the provinces of Asir, Jizan and Najran. If you have been following developments in Yemen you will recall that Asir, a rights organization, announced back in 2012 it had started a national campaign to return what it called "Yemen stolen territories" from the Saudi occupiers. In June 2012 Abdul Rahman al-Ashwal, the group' spokesperson told me in an interview that his primary goals is " to create internal Yemeni awareness and establish and deepen the importance of a national popular awareness of its rights and territories under Saudi occupation. Preparations are underway to establish a popular and civil protest movement against the Taif and Jeddah border agreements." Asir has based its claims on a comment which late President Ibrahim al-Hamdi made in 1977 during a state visit to Taif in Saudi Arabia. He then told the king: “I am still in Yemeni territory. If you wish to discuss the issue, we can start with this point." Asir’s main argument is that territorial rights do not have a statute of limitation. Legally speaking the group is right – politically speaking Asir has stood on very shaky ground. Why you may ask? Because NO ONE stands up to Saudi Arabia and live to financially tell the tale! Should Yemen’s stolen lands be restored Yemen would no longer be the most impoverished nation in Southern Arabia. Yemen would sit where it was always meant to sit – at the head of the Arabia’s table. But money and access to natural resources are the only cards Yemen would then have at its disposal. Allow me to introduce you to a very different Yemen – a Yemen which still could be if only Riyadh was to withdraw back behind its real borders. According to recent studies Yemen's oil reserves would account for 30% of the world's reserves, outbidding Saudi Arabia itself. And though so far Yemen has been unable to exploit its oil and gas resources, - given half a chance Yemen could rise a giant in the region; a thought which is not exactly thrilling al-Saud Royals.